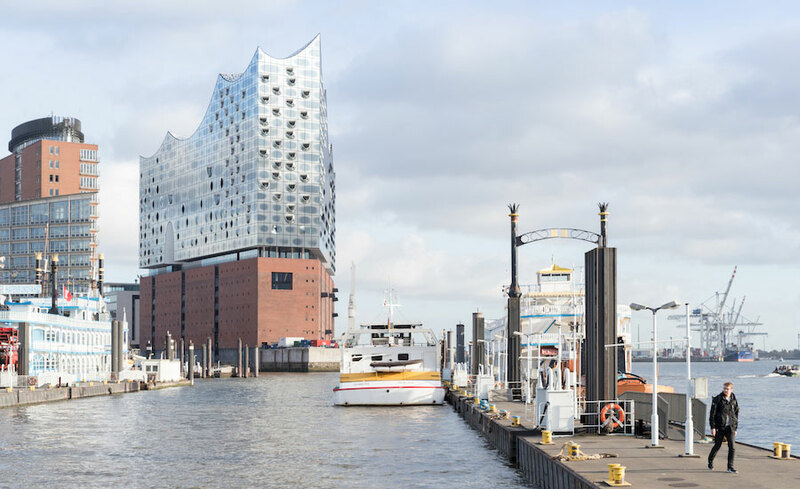 Like a giant, seafaring ship with rippling sails of glass instead of canvas, and a brick base instead of a wood hull, the new Elbphilharmonie commands the harbor of Hamburg’s still active port in northern Germany. The concert hall, hotel, and apartment structure designed by the Swiss firm of Herzog & de Meuron (and local architects Hohler + Partner) sits at the western tip of HafenCity. There it functions as a glittering beacon for this 390-acre residential and commercial waterfront redevelopment under construction along the Elbe River. While Elbphilharmonie’s grand 2,100-seat concert hall, and its 550-seat recital hall don’t open until January 2017, already there is plenty of activity. The “plaza,” an elevated public space nine stories above ground—between the brick base and the new glass structure on top, opens this week.